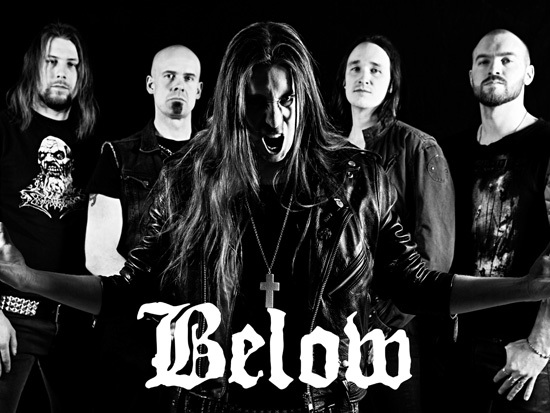 Below, from Nyköping in Sweden made securing a record deal look easy, as the band received an offer from Metal Blade after the band’s very first demo last year. I phoned bass player Andreas Hedman to talk about this, and of course the band’s debut album, “Across The Dark River”. Not a lot are known about the individual members of Below. Have any of the members a history of playing in bands together? -Yeah, absolutely. Queensryche it is. Me and the guitar players once had a band more in the vein of Pantera. I was doing the vocals in that band. When I think of Nyköping, I think of the thrash metal band Mezzrow. Do you know them? – I have two friends in Mezzrow, the bass player and one of the guitar players. In fact, we have been in a Metallica-cover band together. You see, Nyköping is a really small town. Which of the members formed Below then? And what were theintentions of the band back then? – Our intention was to create a new kind of doom metal. The singer and the guitar players got together first at a party, and talked about it. Soon we were trying out some ideas and came up with some common ground in doom metal. All members have their input on the sound, and we’re doing the songs together. For example: Both I and the guitar players come up with riffs. The singer also has some input and everybody participates. You and the drummer obviously joined the band sometimes after the three others came up with the idea? – Yeah, six months later or something like that. I didn’t know the drummer from before. 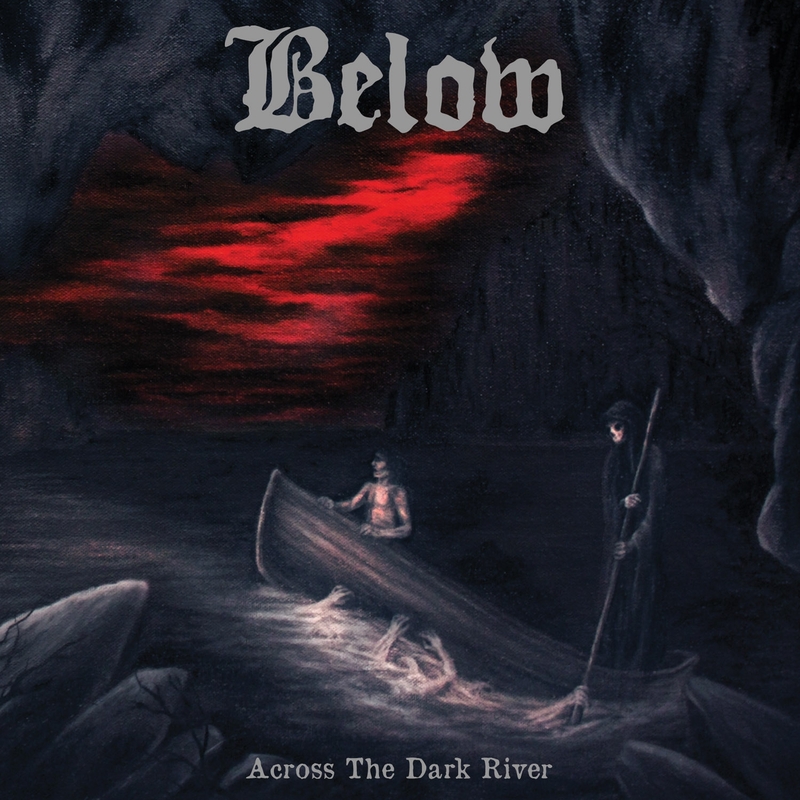 Below was formed as late as in the fall of 2011. Are you surprised by how fast things has happened around the band? – Yeah, absolutely. Things have happened very fast. Tobbe and Sebastian from Howling Owl are friends of us, and when Tobbe heard the demo that we recorded in Nyköping, he immediately asked if he could work with us and present the tape for some labels. He sent it around and we got three decent offers. The most interesting one came from Metal Blade of course. 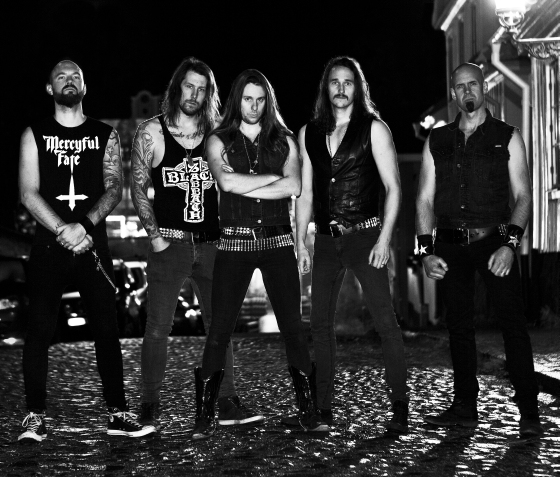 Tobbe already had a connection to the label since he plays in Noctum which is signed to Metal Blade. Do you think this connection was vital in you getting the deal? – I think it was the strength of the material that was the main factor, but nowadays it is important to get people to listen to your material, and going through Tobbe was a way to get the right people to listen to the material. Metal Blade gets hundreds of demos every day, and I don’t think they even listen to all the stuff they receive. For a moment, we considered one of the other deals we received as well, but when Metal Blade came knocking, we went with them of course. When things happen this fast, it’s often because of the quality of the music, or because of luck and coincidences. What was most important in your case? – I think the material has a good focus, and you can really hear that there is an idea behind it. There is a red thread in everything we do, and it’s quite easy stuff to listen to. The good thing is that we have a lot of material that we have put aside.The stuff on the album is only the top of the iceberg. We only used the very best song we had for “Across The Dark River”. This resulted in a coherent album, where all the songs are of similiar quality. Will you use the left over material later, or are these songs a closed chapter by now? – We will use them. By the way, we are in the song writing process for the next album right now. We are mostly testing ideas and putting together songs. You name bands like King Diamond, Candlemass and Tony Martin-era Black Sabbath as some of your main influences, but which releases by these acts have been important for Below? – The “Headless Cross”-album, “Abigail” and “Nighfall” are all very important. It think it’s something combined from those albums that we want to sound like. – I didn’t’ listen so much to the stuff with Tony Martin until recently either, I was more into “Mob Rules” as well as “Heaven And Hell”, but I’ve been listening to both “Headless Cross” and “Tyr” during the last year, and really learnt to appreciate those albums. And Tony Martin of course. I was actually listening to a live recording from 1996 the other day, where he does “Children Of The Sea”. It sounds really amazing. “Chapter VI” by Candlemass is another album I came to think of when listening to “Across The Dark River”. – I like the “Black Dwarf”-album (must be the self titled one from 2005). I also think all the albums with Robert Lowe are underrated. It’s a shame that he left the band, cause I really like direction of those albums. The lastest albums have a bit dirtier sound, and sounds more primitive, while we’re more influenced by the eighties stuff like “Nightfall” and “Tales Of Creation”. There’s been a few Swedish doom metal bands through the years. Are you familiar with Memory Garden or Sorcerer for instance? – No, I am not so familiar with those bands. I haven’t listen properly to any of them, although I think have heard a bit of Memory Garden. I’ve heard the name Sorcerer, it’s a band with a good reputation, but I haven’t listened to them at all. I spend a lot of time practicing on my guitar, and when I find the time to listen to music, I am into the old seventies stuff, Deep Purple for instance, but also a new band like Blood Ceremony, which I think is great, along with The Devil’s Blood.. That’s the input I bring into the band. It’s mostly about a different genre than Below of course, but those bands are certainly some of my influences. – Yeah, it makes sense not to include it. We came to the conclusion when we put the album together that the song didn’t fit. In fact, we recorded it during our session at Sonic Train, and intended to use it for the album, but when we heard it and put it together with the rest of the material, it simply didn’t fit. That’s a brave decision, as you got some very good feedback on that track when you put it online? – Yes, we did. The song for sure has some good qualities, but when it was suggested from one of the members that it didn’t fit, we discussed it briefly and made a decision everybody agreed on. No pressure from the label to include it either? Will you consider the song for your next album? – Perhaps. Actually three days ago, the same question came up. What shall we do with this song? As it looks now, we’ll use some parts of it for the next record, but probably not the entire tune. Have you met some people who are disappointed that the track isn’t on the album? – No, just a few people that have voiced their opinion on Facebook. Listening to a doom metal album these days, we have learnt to expect a faster song or two. Wouldn’t a faster song have made the album more diverse? I am asking, cause there is not a lot of different tempos on the album? – No. Everything is rather slow. If you listen to the version of “Trapped Under Ground” from the EP, the version is a little faster compared to how the song turned out on the album. We were adjusting the tempo of the songs before we went to Sonic Train, in fact we spent a lot of time on that. We thought “Trapped Under Ground” sounded better when we took the tempo down a little bit. It was like something happened with the groove in the riffs. -Obviously someone is waking up inside a coffin, and he doesn’t know where he is. The song is influenced by a movie we saw, I think it’s called “Buried” or something like that. The whole movie is filmed inside a coffin. We tried to capture the feeling when you wake up and realize you are trapped. At first you don’t know where you are, but then you realize that you are inside a coffin and that you are soon going to die. The intro to the song was something the band thought of after they recorded the song for the first time in Nyköping. Andreas says that they had a lot of fun when they did the intro. He was bringing his old motorcycle canvas and then dragged the Sebastian on it to make that particular sound. The band then started digging in the ground outside of Andy LaRoque’s studio and put that to tape too. Is “In My Dreams” a link between he song “Portal” and “Mare Of The Night”? –It’s an intro to “Mare Of The Night”, which is a song about dreams. They seem dark and depressing, is there a sense of hope or optimism in your lyrics? – The lyrics are written mostly by Sebastian and me, but mostly by Sebastisan. If you listen to the song “Bid You Farewell”, this song is a bit deep. It’s a tune about saying farewell to somebody that has died, or about a change. The lyrics are really simple, but you can interpret them in different ways. This one is both depressing as well as positive. Otherwise the music is dark, slow and depressing, and the lyrics have to follow the same pattern. We’ve alreday mentioned the song “The Whitechapel Muderer. Do you know the band Blitzkrieg? – No, I’ve only heard the name. That’s all. I recently spoke to the singer, he has read everything there is to read about Jack The Ripper. How deep does your own fascination for the theme go? – In fact, I don’t have any fascianation. I saw something about him on Discovery Channel,and in my opinion, the most fascinating thing is that they never caught him. The lyrics really don’t go that deep, but an unsolved murder is always a good theme for a metal album. You have said about the new album that it will leave its mark in the history of doom. Quite big words coming from a newcomer. Do you have a lot of confidence in your own ability? -Yeah, actually we have. This band has been our home for a long time, and it’s an honour to get our music out . There are so many great bands that never get a chance to be signed to any label, and are struggling throughout their whole career. We got this chance and I think we have something to say. If the album will leave a mark, I really can’t say, but we hope people will like it. What is the best feedback you can possibly get? – The best feedback? What would that be? One of the best moments was when I was recording bass in Andy LaRocque’s studio and he was looking inside, digging the music. Since it was a riff I had done, it was a really great feeling. Andy is a person I have looked up to for so long, and to get some sort of confirmation by someone like him is awesome. The feedback we got from the audience when we played at Hammer Of Doom in Germany was amazing too. It’s something you dream about when you create songs and music. What was Andy’s most important input on the album? – He didn’t participate in the songwriting or intervened in how we should present the songs or arrange the riffs, but he was very professional and competent with the sound. He knew how to get the sound to make it really epic. Andy has a lot of experience and he works very fast too. You can’t be at his studio to drink coffee, you have to work when you are there. Andy’s assistant, Olof, was also helping us a lot with the recording and he had some input with the intro and also some of the sound effects. He is a very competent person too. A lot of the bands that record with Andy ask him to do a solo on their album. – We asked him early on, and he said he would do it if he got the time. He ended up doing an intro solo to one of the songs, “Ghost of Sheperd”. It’s not a very technical solo, and we enjoyed it a lot. What was it like touring towards the end of last year, when you didn’t have an album out? – It was difficult, because during every gig we were asked if we had anything recorded. We brought along t-shirts, patches, pins and stickers, but most people said: If you don’t have an album out, I can’t buy t-shirt. Or: You sounded great, but I’ll have to check you out later. The single was ready, but it was one week behind, so we didn’t get it in time for the tour. When we went on stage at Hammer Of Doom, the single arrived at Sebastian’s place back home in Sweden. What is it like for a musician to perform songs that the people in front of the stage haven’t heard before? – It’s exciting, because you are getting an honest reaction. Is it good or bad? Do you think it’s possible to get a decent impression of your songs when you hear them once in a live setting? – We are trying to put on a little bit of a show on stage to make it all more interesting to listen to. We want to do all that we do on record live, apart from the choirs which we simply are unable to recreate. They involve too many people. I guess the show at Hammer Of Doom is probably the highlight of your career so far. Were you extra nervous before this gig, with a larger crowd than usual? – No, we weren’t. I think everyone were really pleased to have this festival as the last gig of the tour. We had done five or six gigs before Hammer Of Doom and had really waited for the show, but to be honest, we didn’t expect the stage to be as large as it was. You toured with Devil from Norway. What was that like? – Those guys are absolutely fantastic. We had some great laughs, they are party animals as well. The singer, Joakim had some trouble with his throat, so he didn’ speak between the shows, and were only drinking tea. We really enjoyed the way Stian announced the songs in the show: This is one for the ladies…Or this is one for the guys in Below… He is a really great guy. They called Micke, our guitar player, “partysvenske”. We didn’t’ know what a “partysvenske” is, so we had to ask them. Apparently it’s a person that comes to Norway to earn a lot of money, then he drinks up everything. This entry was posted in Long Distance Runners and tagged Across The Dark River, Andreas Hedman, Candlemass, Epic doom metal, Metal Blade by leifkringen. Bookmark the permalink.